Sophomore guard Chyna Latimer drives toward the basket during Saturday's game against Dayton. The Colonials prevailed over the Flyers during the close match, winning 46-45. Updated: Jan. 12, 2019 at 8:55 p.m.
Senior guard Mei-Lyn Bautista pumped her fist and roared to the home crowd as she saw her three-point attempt roll around the rim, pop up into the air and bounce through the net with six minutes to go in the fourth quarter. Bautista’s shot gave GW the lead after trailing Dayton for nearly 30 minutes, and her teammates followed her example with an intense and emotional performance down the stretch. The result was a 46–45 Colonials (5–11, 2–1 A-10) win over the defending regular season Atlantic 10 champions – the Dayton Flyers (7–7, 2–1 A-10). Sophomore guard Chyna Latimer, who entered Saturday’s contest averaging 3.6 points per game, contributed a season-high 12 points, with six coming in the fourth quarter. But it may have been Latimer’s energy on defense which had the biggest hand in GW’s come-from-behind victory. GW put on its most impressive defensive performance of the season, holding the Flyers to 38.5 percent shooting from the field, including a 1-for-13 clip from long distance, and forcing 19 turnovers. Junior guard Jayla Scaife, who finished with 14 points and nine rebounds, was the only Flyer in double digits. Sophomore forward Neila Luma had yet another strong outing with a team-high 13 points, five rebounds, three assists and two blocks. She has flourished in her two games since being re-inserted into the starting lineup. The Colonials shot just 31.5 percent, but knocked down each of their five triples at timely points in the game. Rizzotti fielded the same starting five of Bautista, senior guard Anna Savino, freshman guard Maddie Loder, senior forward Kelsi Mahoney and Luma that was effective in GW’s previous game against Rhode Island. GW forced 11 first-half turnovers, seven of them in the second quarter alone. Although the Flyers’ size and athleticism allowed them to find scoring opportunities in the paint, the Colonials’ stout three-point defense held up, yielding just one triple in the first 20 minutes. Luma was aggressive and looking to attack in the first half. 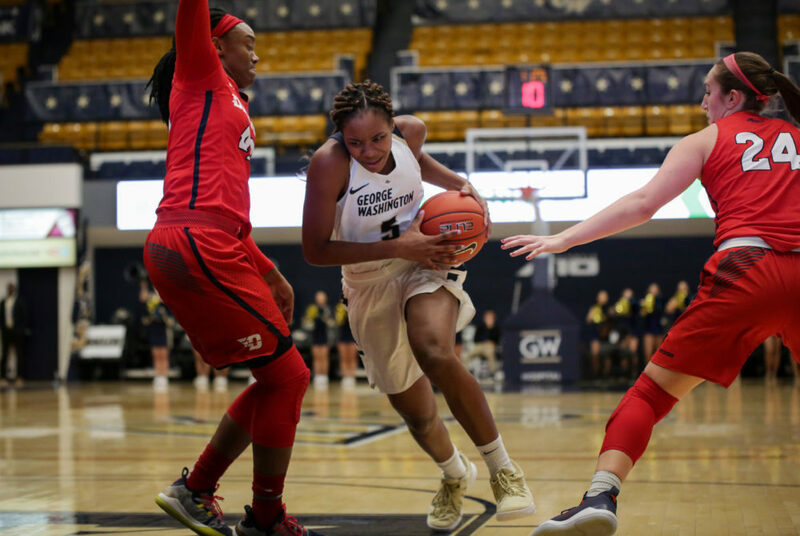 She scored the first five points of the game, allowing GW to knot the score at 5–5 before Dayton hit the gas pedal and sprinted out to a 10-2 run. Latimer came into the game and had baskets on back-to-back possessions to give the Colonials some momentum going into the second quarter trailing 17–11. But the Flyers came out strong and hit two quick shots to extend their lead to 10 points early in the second quarter. As has been the case many times this season, the Flyers seemed ready to put the game out of reach for GW’s low-scoring offense, but seven Dayton turnovers in the quarter allowed the Colonials to keep the game in striking distance. Mahoney was 3-for-3 from long range in the quarter and the home team trailed by just three, down 27–24 at the break. The third quarter mirrored the second. GW tied the contest at 29, but Dayton responded with a 9–0 run led by five points from Scaife on consecutive and-1 opportunities. The Colonials found themselves trailing 40–33 at the start of the fourth. Latimer, who played the entire fourth quarter, had baskets on consecutive possessions, cutting GW’s deficit to just two points. The Colonials were trailing 43–41 with six minutes remaining when Bautista made the game’s biggest shot from near the top of the monument inscribed on the Smith Center hardwood, about midway to half court. After a Dayton timeout, with Latimer on the bench, Dayton redshirt junior forward Julia Chandler scored with three minutes remaining to give the visitors a 45–44 lead. On the other end, Latimer knocked down a baseline jumper, flipping the one-point advantage. A sloppy final two minutes saw turnovers by both sides. Bautista was eventually intentionally fouled with nine seconds remaining, but she missed both free throws. Dayton got another opportunity, and out of a timeout, Scaife attempted to drive the ball and attack the rim. Mahoney and Luma helped to block her shot attempt and secure the narrow victory for GW. Up next, the Colonials will hit the road to face La Salle in Philadelphia Wednesday at 5 p.m.